More likes, more engagement and eventual enquires are the holy grail for social posts – and that is true whether you’re posting images, videos or text. Well content is still king, but there are a couple of additional things you can do to turbocharge your social posts. Start with the right channels! Facebook, Twitter, LinkedIn or Instagram? What works the best? Nobody wants stretched or soggy images. Clean, crisp and impactful images have a much better chance of being noticed. Get the image-sizes right. Or more importantly, the beginning of the copy line. This is what the majority of people are going to see when viewing your posts? Posting at times your audience are actually there, makes a massive difference. 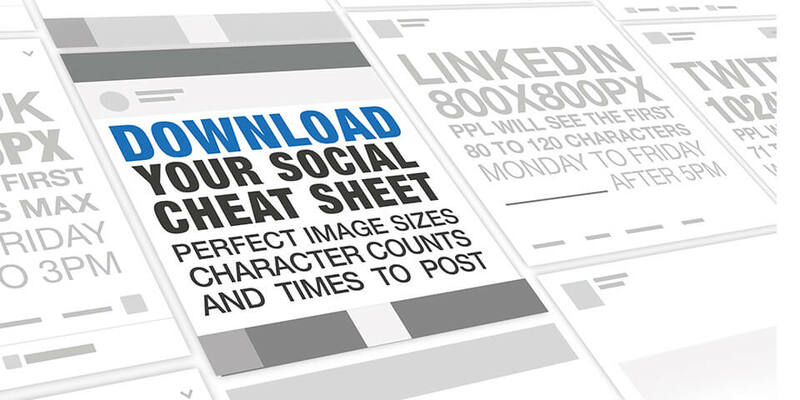 Setting up a successful social post is a bit like lighting a fire. You want the flame to stay alive long enough in at the beginning to ignite the next bit before really getting it all going. The basics above give you the chance to keep that flame alive as long as possible. Most social channels reward content that is liked by others so getting those initial likes is crucial. The best posts sit at the top of other people’s news feeds longer and crucially gets you seen that little bit longer in this busy world. Our latest ‘Cheat Sheet’ is the result of our own experiences with social media. It is based on what we know – works. It has been designed to be printed out and sit at the back of your notebook, stuck on a wall or just be read digitally.